In the International Rube Goldberg Machine Contest held recently, our team from Sci-Tech Rogozin Migdal-HaEmek was awarded fourth prize worldwide. Rube Goldberg was an American cartoonist, engineer, and inventor, who enjoyed inventing and drawing highly complex machines which perform very simple tasks. Named after him, Rube Goldberg Machines are complicated, multi-part systems, which progress step-by-step through a long and complex chain of actions to perform a very simple task. Every year, all around the world, there are local competitions for Rube Goldberg Machines, including the Israeli Incredible Machine Contest. Each competition revolves around a predetermined theme, which the machines have to incorporate. The contestants are required to build a machine facilitating various energy transformations, by utilizing the domino effect: each object sets another object in motion, leading to the final outcome, as defined by the theme of the contest. The 2018 Incredible Machine Contest, sponsored by the Nobel Laureates for Excellence in Science Education Foundation, drew competing teams from all over Israel. 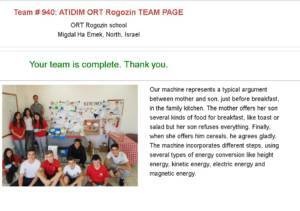 The team of students from Sci-Tech Rogozin Migdal-HaEmek, led by Eliran Yahav, won the third prize in this national contest. This achievement gave them a ticket to represent Israel in the international contest, where they arrived fourth. The team included three students: Oryan Toledano, Lior Ifergan, and Tohar Ananayev. The machine they developed, called Pour a Bowl of Cereal, simulates a mother-son dialogue concerning choice of breakfast menu.